Patios can come in many forms. They can be cement, wood, stone and many other materials. They also have many uses. Cement patios are the most economical and the most durable of all materials when you are looking to build your own patio. It can also be used in many different ways. The cement can be colored, stamped and patterned which can make it look like another material. Patios are the perfect way to enhance your outdoor space. A patio is the perfect way to add a great entertainment space to your yard. Grass can be uneven and riddled with holes, a cement patio is sturdy and level so it’s perfect for setting up tables, chairs, grills, and anything else you need for an outdoor get-together. Patios can also be used as an extension of your home if you enclose it or install netting or an overhang it can feel like a natural extension of your indoor space. If you’re looking to enhance the outdoor space, extend the indoor space, or just have a place to relax outside, a cement patio is a perfect solution. Are you interested in learning more about concrete patios for your property? If you are thinking about it, you should schedule an appointment to talk about our many products, services, and options. Here at D & G Cement Co., we’ve been providing outstanding cement services for over 50 years to the metro Detroit area. 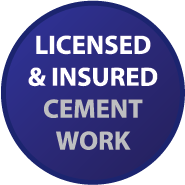 Our services include designing, pouring, and sealing cement. To learn more about patios and the rest of our top quality cement products and services or to schedule an appointment give us a call at (313) 277-2676.